If you are looking for a way to save green and live green, then head to the Gap from now until March 14th for the nationwide "Cotton. From Blue to Green" Denim Drive. 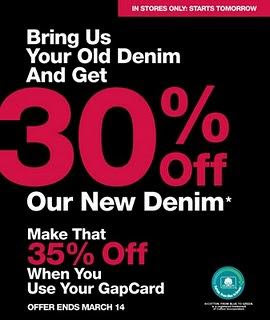 Bring in your old pair of jeans and the Gap will give you a 30% discount off a new denim purchase from the Gap, babyGap and GapKids. Sounds cool right? If you are wondering how recycling fits into the promotion, think UltraTouchTM Natural Cotton Fiber Insulation, and communities in need. The Gap has partnered with Cotton Incorporated and will be using the recycled jeans to provide natural cotton insulation in new homes in areas of need like the Gulf Coast Region. “Cotton Incorporated is delighted to team with Gap on the COTTON. FROM BLUE TO GREEN.® nationwide denim drive,” said J. Berrye Worsham, President, and Chief Executive Officer, Cotton Incorporated. “Year over year, this program continues to gain momentum, and the collaboration with Gap will build on the program’s success over the past five years.” Since the program began, the COTTON. FROM BLUE TO GREEN.® denim drive has recycled enough denim to create natural cotton fiber insulation for over 540 homes. So here is a way to really make a difference and save cash too! Be sure to get to your nearest Gap before March 14th for a feel good way to save and remember to spread the word! Nice post and thanks for sharing with us. It is needs nowadays everyone, because everyone wants to live healthy and green. Their services are extremely great. I hope people do take advantage of this b/c it truly is a great way to help others and help ourselves. Who can't use a discount these days huh?